The What: NTW (Networking the World), a connectivity solutions provider for AV and IT professionals, has released its Ultra-Slim HDMI Cables through distribution partners, including Stampede. 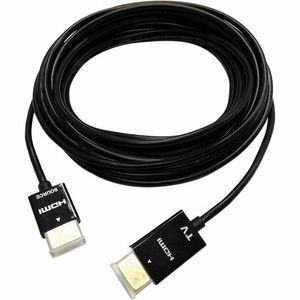 The Application: According to the company, the Ultra-Slim HDMI Cables are thinner and lighter than average HDMI cables, making them ideal for easy handling and flexibility in AV applications. The triple shielded cables are made with 99.99 percent oxygen-free copper to increase the product's conductivity and reliability. Perfect for modern, high-performance applications, the new thinner cable supports data transmissions up to 10.2Gbps (up to 100'), 3D video signals, Audio Return Channel (ARC), 1080p and 4k by 2k resolutions through the low-profile RedMere chipset technology.